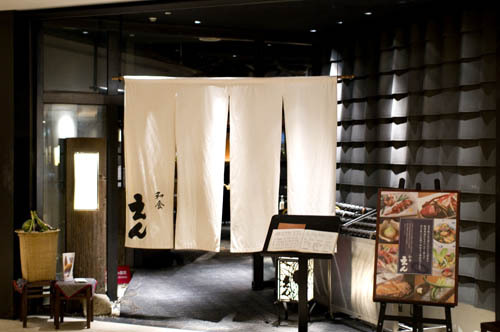 "Washoku En" is a deluxe branch of a small izakaya chain known for their high-quality original food, design-savvy interiors and good value for money. The service here is still izakaya-style - beer, sake and shochu to drink, small dishes to nibble on - but the stunning decor and the beautiful presentation take En to a level far beyond the typical after-work drinking spot. The Oazo office complex in Marunouchi offers an unusual view over the red brick buildings and the tracks of Tokyo Station, and En takes good advantage of this location. A large horikotatsu dining area looks out over the station through a long span of floor-to-ceiling windows, while private dining rooms on the south side offer views of the Maru Biru and beyond. 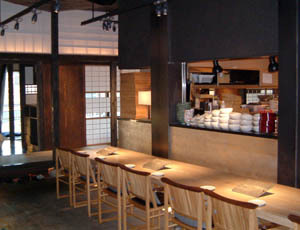 En also has a spacious main dining area at the entrance, with a comfortably wide counter and numerous tables. High-quality materials and craftsmanship are evident throughout the restaurant - beautifully patterned screens, smoothly polished blond-wood tables and counters, burnished metal columns. The servingware is also quite lovely, including beautiful glassware - lightweight, attractively rounded, perfectly balanced in the hand. Dishes and bowls, lacquer trays, serving chopsticks - all meet the same high standards. The kitchen turns out simple seasonal dishes, with modest prices and small-ish portions so you can try many different flavors. Grilled salmon belly is pleasantly oily with crunchy skin - a great combination. The cold eggplant and asparagus is exceptional, with a deep smoky tang and just a hint of vinegar to bring out the full flavor. The crisply grilled chicken comes with its own tray of condiments - garlic soy sauce, miso, and salt with sansho pepper. And there's plenty more on the menu in the way of grilled fish, meats, and tofu and yuba dishes. Drinks include thirteen premium sakes (one served hot), balanced between familiar names and more unusual finds, plus thirteen kinds of shochu. Wines are thoughtfully chosen, with good-value Australian reds and solid choices in white like Cloudy Bay Sauvignon Blanc (Y6400). There are four wines by the glass or carafe, and Yebisu beer is on draft. Budget around Y4500-6500 per person for an average-sized dinner with drinks. En also serves lunch.